Gallery Furniture wants to reward YOU for sharing your thoughts on any recent purchases you’ve made from us! 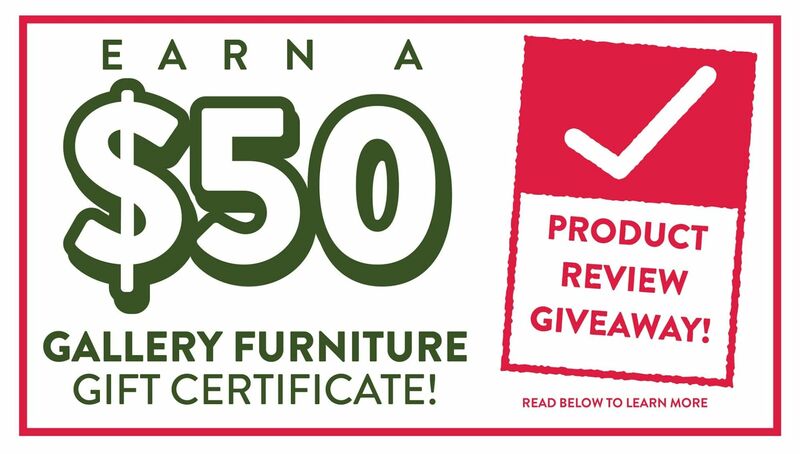 With our Product Review Giveaway, you have the chance to earn a FREE $50 Gallery Furniture gift certificate for every product review you submit to GalleryFurniture.com. There is no limit to the number of product reviews you may submit and for each review, you will receive a $50 GF gift certificate. Please note that only products that are currently visible on GalleryFurniture.com are eligible for review. Fill out the form and leave a review of your purchased product. Remember, with each review we want to hear your likes, dislikes and all opinions in between! Once you have written your review(s), simply print your review confirmation e-mail(s) which will serve as your $50 GF gift certificate and bring them to a Gallery Furniture near you to be verified! Once verified, you are free to spend your $50 GF coupon at any three of our convenient Gallery Furniture locations. Multiple entries will result in 1 combined gift certificate holding a value of $50 per confirmed review of a product purchased at Gallery Furniture. Reviews must be of a product you have purchased directly from Gallery Furniture, either in-store, online or by phone. Reviews must be of a product that is visible online at www.GalleryFurniture.com. Reviews must be written either by the person who purchased the furniture, or a family member who resides with the purchaser at the delivery address listed on the order or at a new residence. No limits on the number of reviews, but only 1 valid review per product per household. Only products currently visible at www.GalleryFurniture.com can be reviewed. Previously purchased products may be currently discontinued or otherwise not listed: these items are exempt from this giveaway as online reviews cannot be entered. Awarded gift certificates are non-transferable and have no cash value. Promotion limited to products currently on website. Electronics and rugs are not eligible for purchase with GF gift certificate(s) earned in the Product Review Giveaway. We look forward to hearing your thoughts on your Gallery Furniture purchases! Thank you for choosing GF and we will see you again soon when you come by to spend your GF gift certificate!